We all are familiar with LED’s and specially with latest versions of TVs that comes in 4K resolution. Samsung Electronics is very famous for every kind of TVs and LED’s. Earlier, Samsung launched QLED’s with different sizes. The highest size in Samsung LED TVs is 85 inches and it went very impressive in higher segments. QLED TV is Samsung’s great achievement because of its realistic picture quality and so many shades of colours created by Samsung’s proprietary Quantum dots. Now Samsung is ready to set new boundaries with its brand new TV sets, which offers high quality 8K resolution display in a big size screen. The news is, 85 inches Q9A QLED TV is getting honoured for becoming Samsung’s first commercial ‘upscaled’ 8K LED. This LED is upscaled with an unbelievable 7680×4320 resolutions. 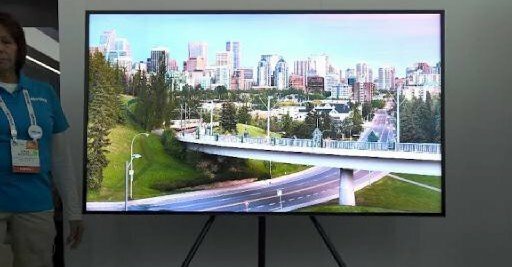 Samsung announced this Q9S QLED in front of few audience who was invited at its grand event of this new 8K TV, at CES 2018 with event, it is first for the company’s new MicroLED TV to explore new world. You can say, this 8K led is so far compare to its time because another electronic companies are not that much capable to compete with this kind of invention. This Q9S TV is still get counted in QLED’s by Samsung. QLED TVs have full colour volume and billion shades of colour and because of the Quantum dots, picture quality is become greater as compared to any prior Samsung product. It contains superior peak brightness only on the needed parts of screen. QLED also provides fantastic 4K HDR experience for gamers and other audiences. It produces excellent color saturation in every conditions. Samsung’s Q9F TV was launched last year and get good reviews from buyers so no doubt this Q9S QLED TV is going to be very famous in market so early. There is no data for its launch, I guess it will make debut very soon. The famous apps like YouTube TV, Amazon Prime Music, Jio Cinema apps are now in the race to take advantages of it so do Netflix. What do you think, are you going to buy this Samsung 8K TV when it comes into your country? Tell us your opinion about this new 8K TV in the comments box below.